The masseter muscles are the powerhouse muscles of the jaw. They are the major force in biting and chewing. You can see where your masseter in the mirror if you look below your earlobes and grit your teeth. 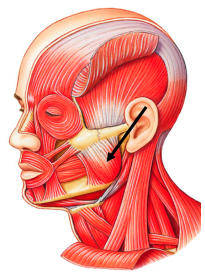 Trigger points within the masseter muscle can cause pain in multiple places. An important cause of pain in the temporomandibular joint is due to a trigger point within the masseter muscle. These trigger points within the masseter can increase muscle tension, which can lead to pain and restriction to jaw opening. The masseter trigger points can affect both upper and lower teeth, being a source for hypersensitivity to heat, cold and tough, which can lead to soreness when brushing or eating. Trigger points can be found at any place in the masseter, from the cheekbone to the bottom edge of the jaw. These are known to cause pain in the front of the face, under the eyes, and over the eyebrows, symptoms that are sometimes mistaken for sinusitis. You can help relive jaw pain by not chewing gum, avoid biting your nails, don’t chew ice, and by not opening things with your teeth, also by avoiding grinding and clenching your teeth when stressed or under pressure.